August 31, 1925 – The first one-eighth mile of the new Wacker Drive, running east and west along the south side of the river is opened, a project that is expected “to take 41 per cent of the traffic congestion out of the loop.” [Chicago Daily Tribune, August 31, 1925] All day motorists are attracted “into that broad one-eighth of double decked esplanade like bees to a posy.” The “smooth upper level roadbed” is 72 feet wide and is bordered on one side by a 24-foot sidewalk and on the other by an 18-foot sidewalk which overlooks the Chicago River, 15 feet below. The paper reports that United States Vice-President Charles G. Dawes has recently conducted a tour of the project for General Geroge Goethals, the chief engineer of the Panama Canal, finished 11 years earlier. 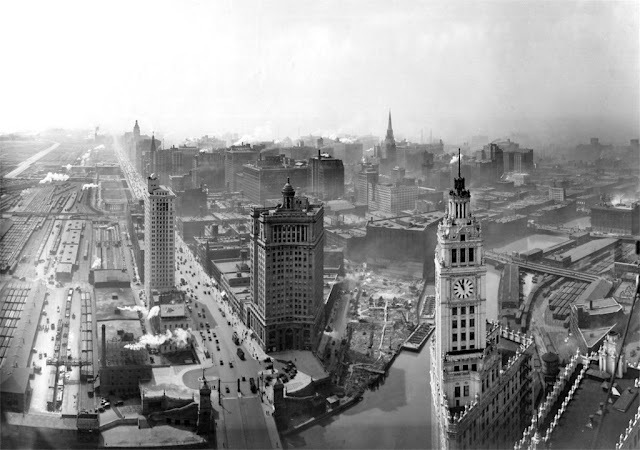 Goethals reportedly remarked, “There isn’t anything equal to this at home or abroad.” Reports the Tribune, “From the finished one-eighth he could visualize the finished stretch of concrete quays, lower level street, upper level street, circling stairways, balustrades, pylons, lamps, pilasters, pedestals and arches which will sweep gracefully along the river’s south bank for three-quarters of a mile from North Michigan boulevard to the junction of Lake and Market streets”. The east end of Wacker Drive begins to take shape where the barges are docked across the river from the Wrigley Building. August 30, 1891 – The Chicago Daily Tribune greets news that a new art museum will be built on the lakefront with an editorial in its favor. “The most important feature of the scheme, however, is the securing of a permanent art gallery for the city of sufficient dimensions to meet all demands for long years to come . . . It may be anticipated that the new structure will be as perfect as money and skill can make it, and as beautiful as artistic taste can suggest . . . something which will more clearly reflect the growth of enterprise, skill, and artistic taste in the World’s Fair City.” The paper, and the city along with it, got its wish.